Cook ground beef and onion until beef is no longer pink; drain excess grease. Stir in green chilies (with it's liquid), water and taco seasoning packet. Simmer until the liquid is absorbed. Stir in pasta sauce until mixed in with meat mixture. In a separate bowl, beat eggs. Stir in ricotta cheese, cilantro, cumin and 2 cups of Mexican cheese. Spread a small portion of meat sauce over the bottom of a 13 x 9 pan. Top with 3 noodles laid side by side. Spread 3/4 cup ricotta mixture over the noodles. Spread 1 1/4 cups meat sauce over the ricotta. Sprinkle with one third of the remaining cheese. Repeat steps two more times. Cover with aluminum foil and bake for 40 minutes. Remove the foil and bake for 10 minutes longer until hot and bubbly. Let stand 15 minutes before cutting. In a medium bowl, whisk together sour cream and heavy cream. Add cilantro, lime juice and salt and whisk until blended. Cover, refrigerate and let the flavors meld as the texture forms into a velvety cream that you'll want to drizzle on everything! 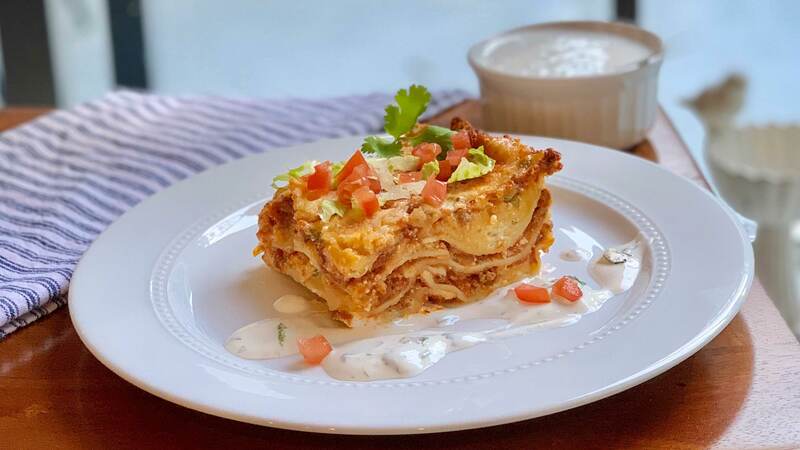 Drizzle Cilantro Crema over the lasagna and top with green onion, fresh cilantro, chopped tomatoes and shredded lettuce.